Guest Post: Be antibiotic wise: Combating antimicrobial resistance in B.C. Since the mid-20th century, antibiotics have made many bacterial infections easily treatable and modern medical procedures such as surgeries and chemotherapy possible. But with the increased use of antibiotics comes an increase in antibiotic resistance. When antibiotics are used too much or incorrectly (e.g. to treat viral infections) bacteria may no longer respond to the drug. Antibiotic resistance is a major global concern, and if not managed responsibly, it has the potential to undo many of the gains made in global health over the past century. Use antibiotics wisely – Bacteria can become resistant to antibiotics if not used properly. Through community outreach, public and health care professional education, and research and surveillance, the program is attempting to reduce the overuse and misuse of antibiotics in B.C. to ensure we continue to have effective treatments for bacterial infections in the future. Pharmacists and pharmacy technicians are often the first point of contact for an individual filling a prescription, and are vital in the safe collection and disposal of left over antibiotics. You therefore play an important role in managing antibiotic use and educating the public on using antibiotics wisely. The continued use and misuse of antibiotics could lead to a future where many infectious diseases may become untreatable. But antibiotic resistance impacts us right now. Patients with antimicrobial resistant infections today are at twice the risk of dying, and it is estimated that 700,000 people globally die each year due to antibiotic resistance. In 2016, 23 million antibiotic prescriptions were dispensed by Canadian pharmacies, but 30 to 50% of these prescriptions are estimated to be unnecessary (often due to being prescribed for viral infections). With pharmacists’ scope of practice now including the ability to adapt and renew prescriptions, antibiotic prescribing by pharmacists has increased significantly in recent years. 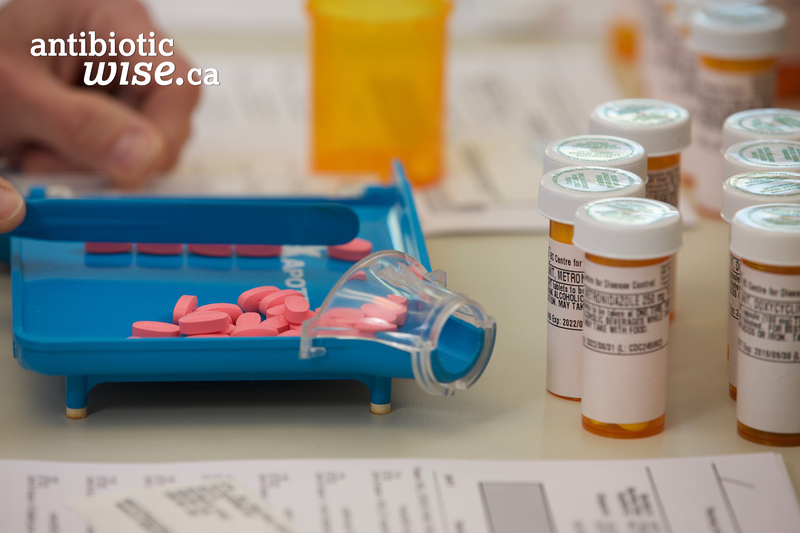 While still making up a small percentage of all prescriptions written in B.C., there is a need to continue to monitor this trend and ensure prescriptions are based on best available evidence. The BCCDC publishes Antimicrobial Utilization and Resistance dashboards, tracking these trends in B.C. using B.C. PharmaNet and LifeLabs data. In the 13 years since the program’s inception in B.C., significant gains have been made. Antibiotic prescribing has decreased more than 16% since 2005, and the use of specific antibiotic classes, such as macrolides and fluoroquinolones, has decreased even further. Because of enhanced stewardship, including professional education and public outreach campaigns, the level of antimicrobial resistance in samples collected in B.C. has remained stable. The initiative has been successful in arresting the increase in antibiotic resistance in the province. Since 2005, nearly $450 million dollars has been saved on the cost of antibiotics in B.C. due to decreased prescribing and use of the drugs. These savings include both patient savings (in reduced out-of-pocket drug costs) and government savings (in reduced Pharmacare spending), and represents a savings of $76.20 for every $1 spent on stewardship activities. The three key messages of the Antibiotic Wise initiative outlined above are applicable to everyone and represent simple actions that you can take to combat antibiotic resistance. But, as pharmacists and pharmacy technicians, you also have the power to fight antibiotic resistance in other ways. It is important to review all antibiotic prescriptions for appropriateness. Is the antibiotic being prescribed for a bacterial infection? Is the duration of therapy sufficient without being too long? Is the class of antibiotic prescribed appropriate for the diagnosis? And of course, always safely dispose of left over antibiotics. Together with other health professionals, pharmacists and pharmacy technicians have an essential part to play in preserving the effectiveness of this vital resource. To learn more, visit www.antibioticwise.ca or find Antibiotic Wise on Facebook or Twitter. Nick Smith is the Project Manager for the Community Antimicrobial Stewardship program at the BC Centre for Disease Control, including the Antibiotic Wise initiative and the Do Bugs Need Drugs education program. Nick is a resistance fighter working to combat antimicrobial resistance in B.C.